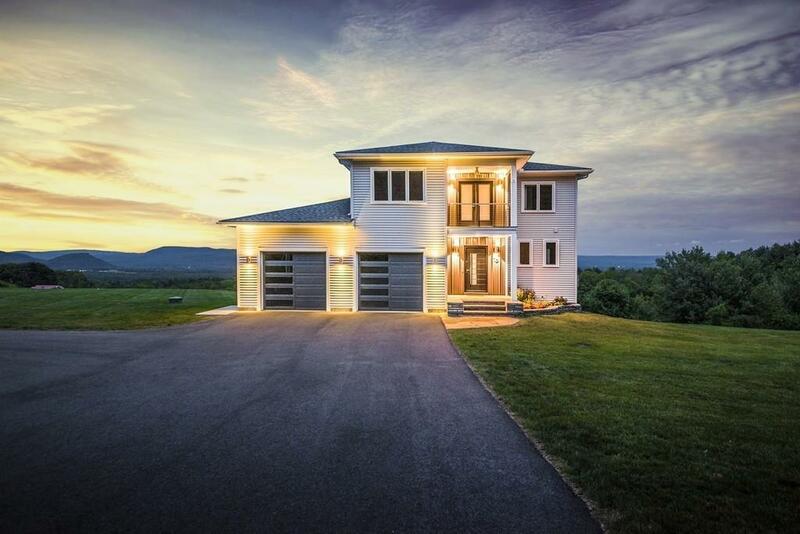 Stunning contemporary with soaring views of the valley, truly not one item left out of this spectacular custom property. Situated on a 3 acre lot with ample space between neighbors on a quiet country road. Watch the sunrise or sunset from nearly any room and enjoy the serenity of what this home has to offer. Custom built, energy efficient, the home features white washed 5 in wide plank oak floors throughout with custom staircases to match, a contemporary fireplace, and an open concept. State of the art kitchen with ss viking appliances, a large island with prep sink, custom cabinetry for ample storage with a separate pantry. Designer baths with marble tile and custom glass doors and vanities, master with soaking tub. Over sized two car garage with epoxy floor and separate electric panel. Generator hook up, tankless hot water on demand. Walk out lower level with concrete patio and views from the room. A rare find and a must see! Listing courtesy of Stacy Ashton of Gallagher Real Estate. Listing provided courtesy of Stacy Ashton of Gallagher Real Estate.